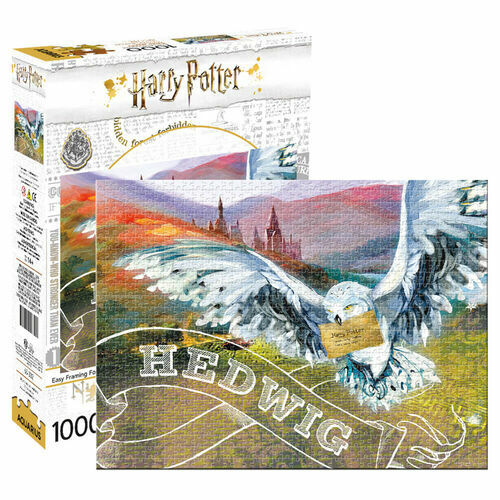 Harry Potter Hedwig 1000pc Jigsaw Puzzle | That's a very smart owl you've got there! That's a very smart owl you've got there! If you're puzzled by what to buy for your Harry Potter fan, look no further! This Harry Potter Hedwig 1000pc Jigsaw Puzzle features Harry's beloved feathery friend in flight. Re-live the drama of your favourite stories as you sort, discover and assemble this magical scene! Hedwig is painted with long textured brushstrokes as he faithfully carries a letter for Harry. Easy framing format: Your puzzle is designed to fit into a 20" x 28" frame, allowing you to display your puzzle without white borders!